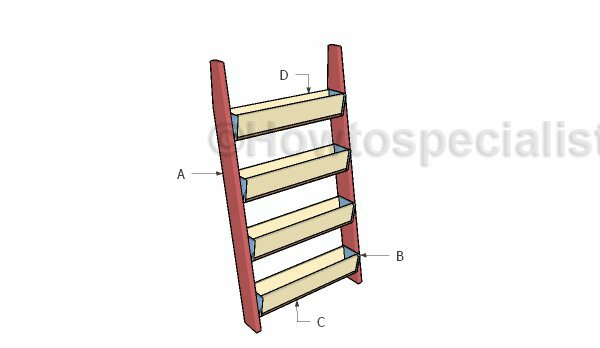 This step by step woodworking project is about free tiered planter plans. I have designed the vertical planters so you can build the unit under 20 dollars. Just make all the cuts and then assemble the tiered planters using the instructions described in the diagram. Make sure you buy 1×6 cedar slats so the planters resist against the elements on the long run. Work with attention and adjust the size of the planters to suit your needs. Make sure you check out my top projects, for a healthy dose of building inspiration. We recommend you to invest in the best materials you could afford. Therefore, you should buy quality lumber, such as pine, cedar or redwood. Always take accurate measurements before adjusting the size of the components at the proper size. Drill pilot holes trough the components before inserting the wood screws, to prevent the wood from splitting. Build the sides from 2×6 lumber. Cut both ends of the supports at 80 degrees. Smooth the edges with sandpaper for a professional result. Make a cut to the top of the supports, so you can lean the tiered planters to the wall. Mark the cut lines and get the job done with a saw. Smooth the edges with sandpaper and remove the excess with a damp cloth. After building the side supports, you have to make the planter. Therefore, start with the sides of the planters. Mark the cut lines on a 1×8 slat and get the job done with a saw. Smooth the edges thoroughly. I really recommend you buying cedar or redwood for the planters, as they will be exposed to moisture. Next, attach the 1×6 bottom to the sides of the planter. Use 2″ brad nails to secure the sides to the bottom. Add waterproof glue to the joints for a professional result. Continue the project by attaching 1×6 slats to the front and back of the planters. Align the edges with attention and add glue to the joints. Insert 2″ brad nails through the sides into the faces. Leave no gaps between the components for a professional result. After building the planters, it is just a question of attaching them to the side beams. Make sure you place the planters equally spaced and insert 2″ nails through the sides into the vertical supports. After assembling the vertical tiered planters, you just have to fill the holes with putty and smooth the surface with sandpaper, after it dries out. Fill the planters with flower soil and choose a location for your new project, so it gets enough sunlight daily. You can make several units and joint them together, if you want to cover a wall or to make a green partition in your backyard. Smart Tip: Make sure you choose quality components that suit your needs and tastes. Adjust the size of the planter before starting the project. Take a look over the rest of my outdoor projects HERE. Thank you for reading our project about free vertical tiered planter plans and we recommend you to check out the rest of the projects. Don’t forget to LIKE and SHARE our projects with your friends, by using the social media widgets. SUBSCRIBE to be the first that gets our latest projects.